Flt is the file extension for the ArcInfo Float Grid format. It is a binary file that is used together with an ASCII header file with extension HDR. ArcInfo has two commands that can be used to export grids to binary files so they can easily be imported into RiverTools. These commands are GRIDIMAGE and GRIDFLOAT. If the original grid contains 16-bit integer data, then GRIDIMAGE is used with the BIL option. If the grid contains IEEE 32-bit floating data, then GRIDFLOAT is used. To use GRIDFLOAT, a binary file is created in which the floating point data is stored (line by line from north to south). It is this binary file that is called the ArcInfo Float Grid format, which is used along with a header file (called HDR) that contains the geo-referencing information. Once the FLT file is created, it can directly be used in RiverTools. It is to be remembered that the FLT file cannot be used alone; the HDR file has to accompany it. Both these files should also be stored in the same directory. The FLT file contains topological elevation values. 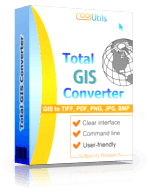 When you need to convert FLT files to other image formats (tiff, jpeg, pdf, bmp, png) use Total GIS Converter.